Yes, I have a brand new pair sitting over here. I installed the Mighty Lift struts as discussed in this forum. Did it 6 mon ths back. Paid $41.97 for two at Autozone. 2) Ground down the piece that holds the ball end so the snap ring that holds the ball in place can be grabbed with a pair of needlenose. I used a portable grinder but a plain file will work. (Will need a way to hold it in place. I have a small vise.) It will just take longer. Tried the drill bit but it did not work well for me. 3) After I pulled the wire retainer (wire) out of the holder the ball came free. 4) Threaded the ball that is now by itself back in the fender and torqued it down. Installed the Mighty Lift strut on the hood then snapped the piece that holds the ball I just screwed in to the fender. Done. Maybe and hour to do both. My mechanic was impressed at the cost saving compared to LEXUS struts. Did feel that the extra pressure required to close the hood was cosndierably more then stock so care needed to be taken when closing as the hood is designed with a week spot halfy way as part of the crumple design when in an accident. Duly noted but to date it has worked VERY well with no regrets. The struts are 'wearing' in so force needed to close hood is less now. Hacksaw will work. You will need to immobilize the piece that has the ball in it so you can cut it. I would not want to do it that way. When I said torque I meant tighten. Torquing is not essential. Unfortunately it sounds like you do not have much in the way of tools. Would hate to see you get it apart and find you can not finish half way through. You have to grind/drill the hood to recover the ball joints. Once you do that, it's a simple bolt them into the frame and hood, snap the new strut onto those mounts...done. The Mighty Lift are strong enough that I only used one. AutoZone is the only shop locally I found that has the part discussed inthe other hood strut threads. Short of that, take one of the dead ones to a parts shop to compare and find the closest one. It's been a spell now...I paid like $32 for both. I ground the old strut hood down on a disc sander and the retaining ring was easy to remove with needle nosed pliers. EZ Snap on and snap off. I found a store on ebay friday that had the struts for a up to 1997 ls 400 with the ball joints for $34.00 plus shipping , think it was $43.00 and some change . They should be in the first of next week. I'll let all know. I've read and done most of the how-to on the hood struts but had to stop when I couldn't close the hood with the mighty lift struts installed. I have a 1990 LS400. I took the strut out and attempted to push down on it with my own weight to see if maybe it's stuck or something. It wouldn't budge. I didn't want to break it so I took it back to Autozone and asked them for a replacement, thinking it's defective. They brought me another one and we both tried to push on it. It still would not budge. I ended up getting a store credit for the item and return here for some more info. I have searched and read the posts about the struts being quite strong at first but will relax after awhile. I didn't want to break the hood trying to close it. For those who did the how-to, did you have any problems closing the struts at first? I'm a 160lb guy and used a lot of force to test out the struts. I don't think the hood requires that much force. This was just for 1 strut while the original unit is still on the hood. you could just go buy a set on ebay for like $50 shipped. 2 x $80 = $160. Dealer wants $110 each. I went the ebay route. 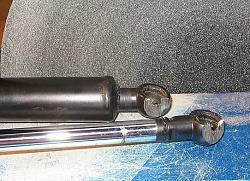 A pair of struts at autozone went up in price to about $40 a pop. Add Tax and the pain of remove the old ball joint exceeds a pair on ebay, which was $40 plus $10 shipping. Both struts installed bowed the hood, in addition, closing it was a challenge. I removed one and it has been serving me fine for the last year. Can't understand why someone would select the mighty lift struts when the ones on E-bay bolt right in and out, work great, and no grinding or altering is required. What am I missing? At the time this tutorial was written, there was no aftermarket support in finding these parts. If they were avialable, it wasn't widely known. Your choice was buy them at the dealer or do this swap as written. Faced with a dealer price or ~$110 per strut or $35 for two Mighty Lift struts...the budget minded choice is obvious. Thankfully these parts are available now so it makes this repair easy.